These posts are reactions to the wealth of beginner courses on coding, some which promise to turn you into an expert hacker in a few months. The “learn to code” movement tells people that anyone can do it, even kids and Barack Obama. These initiatives are admirable to be sure, but in their eagerness to spread the gospel of code, they are not telling the whole story. According to the posts linked above, as well as other anecdotes, people are giving up their studies after leaving the warm, gentle embrace of Codeacademy. 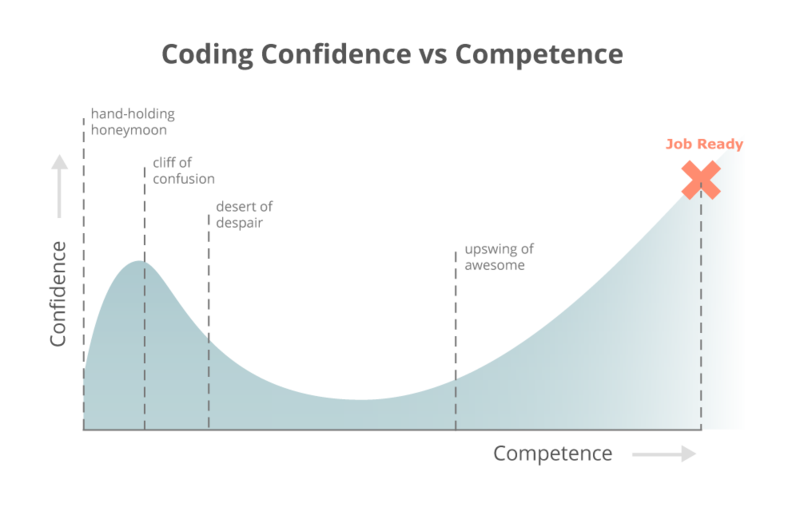 As the Viking Code School post says, after the hand-holding honeymoon with these tutorials is over, new coders are pushed from the “cliff of confusion” into the “desert of despair”, where there is little to guide them into proficiency. This desert is familiar to anyone who took the path of the self-taught coder. Once you realize how little you know (variables and for-loops are but the ABCs of programming) it can be discouraging to go on. Focus and avoid distractions because, if you’re the kind of person who’s interested in learning to code, you’re also the kind of person who gets interested by learning all kinds of other awesome things. When coding gets difficult, you need to be able to push forward instead of just trying out the next cool-looking thing. These are all great tips, but I want to add to them. 1a. In addition to you goal, have a concrete project to accomplish. Your goal can be broad, like “I want to scrape websites with Python”, or “I want to build news apps with Django”. Within that goal, set a specific milestone. For example: “I want to scrape this government database with BeautifulSoup”. Or “I want to map all the homicides in my city like the LA Times did”. 4. Use intermediate learning resources. The lack of post-novice resources for programmers has been acknowledged and there are a few great attempts at filling that vacuum. These are resources that no longer teach you the basics of code, but have you complete challenges and mini projects. It’s here that you’ll learn the most important lesson in coding: the ability to seek solutions or at least hints that will take you closer to a solution. 5. Join your local coding association. Major cities usually have a meetup group for different languages. Go there, make friends, find a mentor. If you’re a journalist leaning code, join discussion groups like PythonJournos, RubyJournos, or RJournos. Folks there are very friendly and helpful. This entry was posted in Ramblings and tagged coding. Bookmark the permalink.